The week left me with an uneasy feeling. There were a number of articles noting the 30-year anniversary of the 1987 stock market crash. I spent “Black Monday” staring at a Telerate monitor as a treasury analyst at Toyota’s US headquarters in Southern California. If I wasn’t completely in love with the markets and macro analysis by that morning, there was no doubt about it by bedtime. Enthralling. As writers noted this week, there were post-’87 crash economic depression worries. In hindsight, those fears were misplaced. Excesses had not progressed over years to the point of causing deep financial and economic structural maladjustment. Looking back today, 1987 was much more the beginning of a secular financial boom rather than the end. The crash offered a signal – a warning that went unheeded. Disregarding warnings has been in a stable trend now for three decades. Alan Greenspan’s assurances of ample liquidity – and the Fed and global central bankers’ crisis-prevention efforts for some time following the crash – ensured fledgling financial excesses bounced right back and various Bubbles hardly missed a beat. Importantly, financial innovation and speculation accelerated momentously. Wall Street had been emboldened – and would be repeatedly. Articles this week posed the question, “Could an ’87 Crash Happen Again.” There should be no doubt – that is unless the nature of markets has been thoroughly transformed. Yes, there are now circuit breakers and other mechanisms meant to arrest panic selling. At the same time, there are so many more sources of potential self-reinforcing selling these days compared to portfolio insurance back in 1987. Today’s derivatives markets – where various strains of writing market insurance (“flood insurance during a drought”) have become a consistent and popular money maker – make 1987’s look itsy bitsy. The record $3.15 TN hedge fund industry barely existed in 1987. The $4.1 TN ETF complex didn’t exist at all. The amount of trend-following finance dominating present-day global markets is unprecedented. Moreover, the structure of contemporary finance has already (repeatedly) proven itself conducive to financial dislocation. Over the years – and especially post-2008 reflation – boom and bust dynamics have turned only more forceful. Central bank fixation on countering the bust has precariously propelled the latest boom. The ’87 crisis response fatefully unleashed the “Terminal Phase” of Japanese Bubble excess – the consequences of which persist to this day. Decades of exceptional development flushed away with a few years of recklessness. Chinese officials over the years claimed to have learned from the dismal Japanese Bubble experience. Clearly, they did not. The 2008 crisis was multiples of 1987. The recent post-crisis reflation, as well, has been at an incredibly grander and prolonged scale. This has ensured that China’s Bubble and “Terminal Phase” have inflated so far beyond Japan’s eighties fiasco. Bubble mirage had Japan’s economy and banking system poised to lead the world. Now it’s China. In contrast to Japan’s beleaguered post-Bubble political class, China’s communist party won’t have to agonize over elections. China faces extremely serious issues – and I’ll assume enlightened Chinese communist party officials are not oblivious. Beijing was the leading culprit behind my disquiet this week. Most focused elsewhere. The Trump administration’s tax package made initial headway in the Senate. There was also market-friendly reporting that Federal Reserve governor “Jay” Powell may be Trump’s leading candidate for Fed chairman. With securities markets rising ever higher into record territory, who cares about some communist party gathering? Heck, is communism even pertinent in today’s tantalizing New Age? Did you see the cryptocurrencies this week? Chinese President Xi Jinping has a plan. China will be the world’s super power. The great communist party, with its progressive system of meritocracy, is the only mechanism to adroitly guide Chinese “new era” development. And President Xi is the master – the modern-day Emperor – with the depth of experience, the vision, the charisma, the power to ensure China’s rightful place on the world stage. He embodies the benevolent dictator for the masses; the resolute commander for an increasingly hostile world; the deity to guide and protect an insecure society. Spooky stuff. Xi and Chinese leadership are battening down the hatches. Recall that less than two years ago the Chinese Bubble was at the brink. It was Xi and his “national team” that took incredible measures to reverse a dynamic of collapsing markets and exodus from the Chinese currency. In short, confronting an inconveniently time bust, they resorted to stoking their historic Bubble. Why not – everyone else has gotten away with it. The upshot has been two additional (fateful) years of rapidly inflating apartment prices and economic maladjustment. There has been as well a couple more years of historic compounding Credit growth. It was only fitting that Xi’s overstated exultation elicited a shot of sobriety from China’s respected central bank chief (from his catbird seat). Credit growth accelerated into the communist party congress. Chinese Total Social Financing (total non-governmental Credit) expanded a stronger-than-expected $277 billion during September. Year-to-date Total Social Financing growth of $2.375 TN is running 16.3% above last year’s record pace. Lending was led by booming demand for household real estate purchases. Total Chinese Credit could surpass $4.0 TN in 2017, easily surpassing U.S. Credit growth at the height of our mortgage finance bubble. Despite all the talk about excessive debt levels and the need for deleveraging, Chinese officials have yet to get their arms around a historic credit bubble. Xi spoke of a focus on financial stability. His comment “Houses are built to be inhabited, not for speculation” reiterates official concern for housing prices. Past efforts to counteract apartment inflation with added supply failed to dampen enthusiasm to speculate on ever higher prices. At this late stage of such a prolonged Bubble, only harsh medicine will suffice. Prices will need to fall and speculation punished for the spell to be broken. Bubbles are always about a redistribution and destruction of wealth. Its unparalleled global scope makes the current Bubble is so concerning. Xi now owns the Chinese Bubble, and there would appear little prospect that he’ll ever be willing to take responsibility for the damage wrought. Fingers will be pointed directly at foreigners, foremost the U.S. and Japan. I believe the global government finance Bubble - history’s greatest financial boom - will conclude this long Credit cycle going back to the conclusion of WWW II. As the “granddaddy of Bubbles,” it is fitting that things turn really crazy during an exceptionally prolonged “Terminal Phase.” We’re at the point where no one is willing to risk bursting the Bubble, certainly not timid central bankers. It’s all quite unsettling. Global finance has run completely amok. This has been unfolding for so long now that few are concerned. Most revel in asset inflation drunkenness. Instead of safeguarding sound finance and stable money – the bedrock of civil societies and peaceful global relationships - governments and central banks around the world are harboring Bubble excesses like never before. This ensures catastrophic consequences when Bubbles burst. It has reached the point where these Bubbles have become part and parcel to global power, with countries not willing to risk being left behind. It’s as if it has become An Arms Race in Bubbles. Three decades of serial booms and busts begat An Age of Government Strongmen – and weak central bankers. It would only be fitting for President Trump to opt for the milquetoast Jerome Powell to shepherd Fed inflationist doctrine, perhaps even trying to placate his base with a slot on the FOMC for John Taylor. Apparently, there are more urgent fights these days than reform at the Federal Reserve. Everywhere, it seems, various fights are taking precedence over stable finance. It just makes one dread the kind of conflicts that could break out when this historic global financial boom buckles. But, then, who on earth cares? The Dow is mere days away from 24,000, and Bitcoin is surely poised to make a run to $10,000! - There has been no inflation because QE did not cause an outsized increase in the money supply. - QE did not do what the Fed intended and has caused many consequences, most notably an increase in bad debt. - The Federal Reserve is tightening the screws on a weak economy caused by an excessive amount of bad debt. - Tightening monetary policy will increase the forces of deflation and cause lower interest rates/lower growth, the opposite of what the economy needs and what the Fed intends to do. The first part to this series covered the mechanisms in which the Federal Reserve conducts open market operations and how the Fed has never printed money, has no legal authority to print money, and unless legislation is passed, will never be able to print money going forward. The Federal Reserve conducts open market operations or quantitative easing (QE) by crediting the reserves of primary dealers (banks) in exchange for securities, namely treasuries and mortgage-backed securities. Reserves are not considered money and are not part of M1 or M2 but rather are part of the Monetary Base. The reserves that the Federal Reserve does in fact create only become money once a bank decides to loan out those reserves or otherwise bring those reserves into the system in which the public has access to it, thereby increasing the money supply or M2. Due to the fact that bank lending never exceeded the historical average and that the velocity of money has been in rapid decline, inflation never materialized despite conventional wisdom. Many investors are unaware of these facts, still believe that the Federal Reserve printed money, and are still waiting for inflation to appear, citing each uptick in wages growth or CPI as the start of an inflationary run, only to be disappointed by a temporary head-fake that quickly subsides as the path to lower inflation and even deflation remains firmly intact. The first part covers this process in great detail, and I strongly encourage you to read that part if you have not done so already. You can find the article by clicking here. This second part will cover the unintended consequences of both zero interest rate policy (ZIRP) and QE as well as the structural and secular issues of that have been exacerbated by the consequences brought on by Fed policy. The next part in this series will demonstrate how the current Federal Reserve policy, one of increasingly restrictive monetary actions including raising interest rates and reducing the balance sheet or quantitative tightening (QT), is actually going to reinforce the secular issues of deflation, which have been made worse by ZIRP and QE, and likely cause more disinflation or even deflation, lower long-term interest rates and much slower economic growth. All of these issues, over the next 18 months, will pose challenges for the stock market as a whole (SPY) and for the banks (XLF) due to a flattening of the yield curve (TLT) and will render most fiscal policy such as tax reform ineffective. My current forecast is that the Federal Reserve is going to reverse the course of monetary policy before the end of 2018 due to severe disinflation and anemic or even recessionary levels of growth brought on by excessive debt, and that the equity market (QQQ) will experience a much choppier ride due to these factors. The Federal Reserve is likely to cut interest rates by the end of 2018 due to falling long-term rates (IEF) that will cause a very flat or inverted yield curve, changing investor sentiment to one of more caution and fear of a pending economic slowdown. The overload of debt that has accumulated recklessly over the past few decades, exacerbated by misguided Federal Reserve policy, has brought the economy to a point where we have mortgaged all our future growth for current (past) consumption. The anemic rates of growth over the past decade are a result of a massive debt overhang that is nearly certainly going to get worse as the debt problem has been magnified. The future picture of economic growth is very dire and will not be solved easily. Debt is an increase in current spending in exchange for future spending. Many theorize that the long-run issue surrounding ZIRP and QE is that excessive money printing will lead to runaway inflation. As I pointed out in part I of this series, the Federal Reserve never printed money, and inflation never materialized, so that thesis has largely been proven incorrect. The true consequences of easy Federal Reserve policy has been an surge in the accessibility of debt, an issue that was already causing massive economic issues. Truthfully, not all debt is bad, but Federal Reserve policy created an incentive to accumulate debt for the wrong reasons, also known as "bad debt." The meteoric rise in "bad debt," stacked upon already crushing levels of existing debt, is the largest issue facing the economy today and will be going forward. Before demonstrating how the Fed manufactured an incentive to accumulate "bad debt," it is important to put into context both the current level of economic debt in the four critical non-financial sectors (Federal, State & Local, Corporate, Household) as well as the increase over the past 7 years. Most investors are aware of the massive debt accumulated by the Federal Government that has soared to nearly $20 trillion and now is over 100% of total gross domestic product (GDP). While the above statistic and its relation to GDP are commonly known yet mostly ignored, the following data on debt accumulated by the state and local government as well as the household sector and the non-financial corporate sector are less well-known. The debt of state and local governments is over $3 trillion. This debt load is worse than any point during the last recession. Turning the page once more to the household and corporate sector reveals an ugly picture for the economy. Since the last recession, debt in the household and corporate sector has increased over $12 trillion and now sits at a record $47 trillion. This debt load does not include many "off-balance sheet" items that would cause these numbers to appear worse than they already are. For example, the numbers on household debt do not include car leases, which in reality are just another form of debt. Many look at the data and suggest that households have deleveraged since the last crisis but do not take into account the increase in debt in other sectors or the lack of inclusion of many "off-balance sheet" items. Looking at the system as a whole, which is vital when trying to map the economy as a whole, the level of debt has increased massively since the last recession, when interest rates were lowered to zero. Lowering the short term interest rates to record lows provided a massive incentive to take on new debt under the illusion that it was "cheap." The result was an unprecedented increase in systemic debt. The debt of the four critical non-financial sectors (Federal, State & Local, Corporate, Household) has increased to an aggregate of $70 trillion, or 370% of GDP. The data is very clear that we, as an economy, are massively more indebted than any point during the last recession. As a system, there is $20 trillion more of debt. To put that into perspective, if that debt had an average interest rate of just 2%, that means the economy would be paying an additional $400 billion a year just to service that debt. That is nearly 50% of last year's total increase in gross domestic product. As debt levels increase, it takes a greater and greater percentage of the national income to service that debt, causing the saving rate to fall and causing a lower percentage of income to be invested into long-term cash-flow-producing goods and services. The Federal Reserve, with their zero interest rate policy for an unprecedented length of time, was the primary driver behind this massive debt increase. The Federal Reserve can control the short-term interest rates. They cannot control long-term interest rates. Long-term rates are primarily determined by inflation and growth. This is a point of contention, although I believe in part I of this series I thoroughly proved that to be true. Given that the Federal Reserve can control short-term rates, by lowering the short end of the yield curve to zero, what the Fed in fact did was manufacture a very steep yield curve (the difference between the short-term interest rates and long-term interest rates). Although the long-term rates were nominally low, the yield spread that the Federal Reserve manufactured was actually the steepest, or the largest spread, in modern history. Not only was the yield curve the steepest in modern history, but it stayed at a very steep level for a very long period of time. The chart below is the same as above, but I highlighted the period of a very steep yield curve to show how the curve in this cycle was not only steeper than past cycles, but stayed at very steep levels for longer than any other economic cycle. I would be remiss not to point out the decline in the yield curve in recent months, which currently sits at its flattest level of the economic cycle, a very telling sign of slow economic growth ahead, but that will be covered in more detail later. 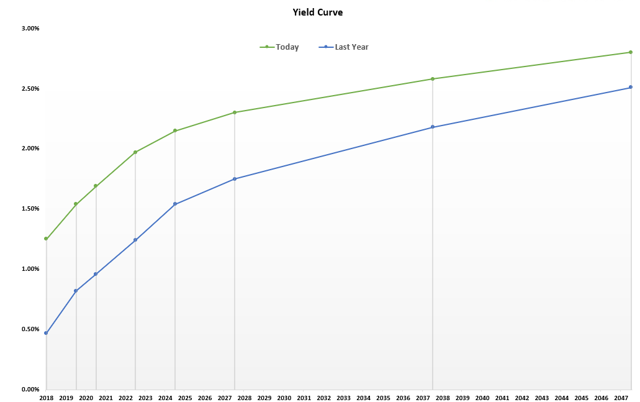 The important point regarding the debt issue that the Federal Reserve perpetuated with their zero interest rate policy can be seen by the manufactured steep yield curve for an extended period of time. When a yield curve is steep, this is more profitable for banks and encourages corporations to engage in "financial engineering" or earnings manipulation through what is called maturity mismatch, or the process through which banks earn money. A bank earns money through maturity mismatch by paying consumers the short-term rate on the money they deposit into the bank and loaning that same money out at the long-term rate. If the bank only has to pay a few basis points on the short end and can loan that money out at 3%-4%, that is a profitable proposition. Clearly, the steeper the curve, or the larger the difference between the short rate and the long rate, the more profitable it is. If the short rate is 1.5% and longer-term rates are 2%, that is only a spread of 50 basis points for the banks, much lower than the 3% spread the banks had the pleasure of enjoying after the Federal Reserve lowered interest rates to zero. If the curve is inverted or the short-term rate is higher than the long-term rate, nearly every loan a bank makes would be close to unprofitable. This is why nearly every recession is preceded by an inverted yield curve. Bank lending grinds to a halt, thereby decreasing the money supply and perpetuating deflation and negative rates of growth. By artificially creating a steep yield curve, the Fed encouraged non-financial corporations to act like banks and try to generate additional earnings through debt-induced maturity mismatch. This can be seen by the record level of debt that corporations took out over the last several years. The corporate debt increase was the largest of the aforementioned four critical non-financial sectors. The level of corporate debt is far worse than at any point in 2008 both on a nominal basis and relative to GDP. Not all debt is bad. Debt is good when the money is spent on a good or service that produces cash flow to pay back principal and interest. When debt money is spent on a non-cash-flow-producing good or service, this is known as "Ponzi-finance" since the principal and interest need to be paid back from another source. The debt increase the corporations incurred was spent primarily on paying down old debt in exchange for new, cheaper debt, or to repurchase shares (share buybacks). Shareholders like these "financial engineering" moves, but they are short-term in nature as the increase in debt and spending on non-cash-flow-producing items (debt exchanges and share buybacks) were made in lieu of longer-term, growth-generating and cash-flow-producing goods such as research and development and plant and equipment. 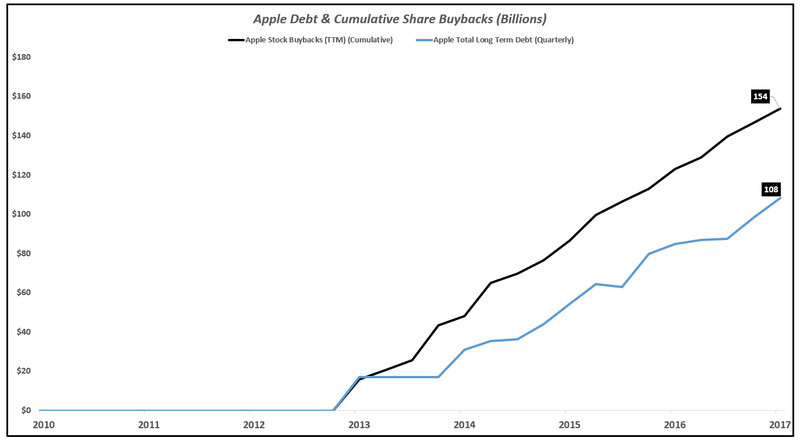 The poster child for foregoing long-term growth in exchange for short-term financial engineering is Apple (AAPL), which increased debt over $100 billion and repurchased over $150 billion worth of stock. Many can make the argument that these moves were rational, but it cannot be argued that the $100 billion increase in debt will have to continue to be paid back years into the future while the share buyback is a one-time event. This is not about Apple, but they serve as one example of a company that, given their $250 billion of cash, likely did not need to take on over $100 billion of debt but did so most probably due to the situation manufactured by the Federal Reserve. While it is true that a lot of the increase in recent debt was done "cheaply," many corporations did this by financing on the Fed-induced "cheap" end of the curve, or in other words, with shorter maturities. In order to keep the level of spending constant, that debt needs to roll over when it matures and therefore be repriced to current interest rates. If the debt is not rolled over, then the spending that the increase in debt facilitated would need to be foregone, reducing economic consumption and lowering growth, or come out of savings, reducing the savings rate and disposable income. The issue arises when the debt needs to be repriced to higher interest rates, which is what we are seeing now and what will unfold in the year ahead. Interest rates have risen across the curve, which is going to make the interest on the current levels of debt much higher. From the short-term rates out to the 10-year rates, interest rates over the last year have increased roughly 80 basis points. Economist Lacy Hunt estimates that over the next year, of the current $70 trillion of total debt (Federal, State & Local, Corporate, Household), around 28% or $20 trillion dollars worth will have to be repriced to current interest rates. This is a combination of short-term debt that was taken out 1-2 years ago, as well as longer-term 5-year paper that was taken out in 2013 when interest rates made a short-term low of around 0.70% on the 5-year Treasury. Using Lacy Hunt's estimate, $20 trillion that needs to be repriced at an average interest rate that is 80 basis points higher translates to 160 billion of additional annual interest expense. Over the past 7 years, the economy has increased at an average of $600 billion. A $160 billion hit to an average $600 billion GDP increase equates to a 25% reduction in growth. Growth has averaged 2.1% over the past 7 years so all else equal, we are looking at growth in the next two years to drop to around 1.6% simply due to an increase in debt expense. This does not even take into consideration the decrease in disposable personal income growth, the decrease in the savings rate, or the increased rate of monetary tightening from the Federal Reserve, which is designed to stunt inflation and growth. This structural issue with the economy has been going on for decades. The level of debt increases, and each year, that takes a larger and larger percentage of our national income to service. Due to the fact that a larger percentage of our national income has to be used to pay down debt, slower economic growth is the result. Look at the long-term trend of GDP growth. This downward trend can be primarily attributed to the increased levels of total debt that takes an ever increasing percentage of income to repay. The 10-year annualized rate of GDP growth is near its lowest level in decades (nominal growth, including inflation). Also, as a larger percentage of income is used to pay down debt, this causes the velocity of money to drop as that income cannot circulate around the economy. A decrease in the velocity of money is a large reason why the Federal Reserve cannot generate inflation. Debt levels increased; interest rates rose. The path to lower growth, lower velocity of money and therefore lower inflation is nearly ensured. The impact of quantitative easing was nearly zero because the Federal Reserve never printed "money," the money supply never increased dramatically, and there was no inflation as a result. The real impact of Fed policy was a lowering of interest rates to zero, keeping them there for an extended period of time, thereby manufacturing a very steep yield curve, which created an incentive to take on large amounts of debt to engage in financial engineering. The levels of debt have increased far beyond 2008, which was a crisis that was brought upon by too much debt, and are now facing the challenge of repricing into higher interest rates. The repricing of debt, even if small, on an economy that is over-indebted can be very material. The simple math shows that conservatively, we are looking at a 25% hit to GDP over the next year or so due to an in increase in interest payments. This does not take into account the lower income growth, lower productivity growth, lower savings rate, and the new Fed policy of monetary tightening. These factors will all be discussed in great detail in part III of this series. The Federal Reserve caused a bad debt problem to get even worse. Debt is deflationary and reduces growth. Since long-term rates trade on growth and inflation, if both are going to continue to drop due to the increased debt burden, then longer-term interest rates will continue to fall. My current forecast is that the Federal Reserve is going to reverse the course of monetary policy before the end of 2018 due to severe disinflation and anemic or even recessionary levels of growth brought on by excessive debt and that the equity market (IWM) will experience a much choppier ride due to these factors. The Federal Reserve is likely to cut interest rates by the end of 2018 due to falling long-term rates that will cause a very flat or inverted yield curve, changing investor sentiment to one of more caution and fear of a pending economic slowdown. Part III of this series will cover the consequences and symptoms of an economy that is over-indebted, including low disposable income growth, low savings rate, low productivity, mal-investment and under-investment as well as why, given these factors, the current policy of monetary tightening of the Federal Reserve is a massive mistake and will reinforce these conditions, likely causing a recession in 2018 if they do not reverse course. Part IV of this series will take on the popular criticism of why this level of debt in the United States will not lead to hyper-inflation in the near future as well as the solutions to this debt problem. 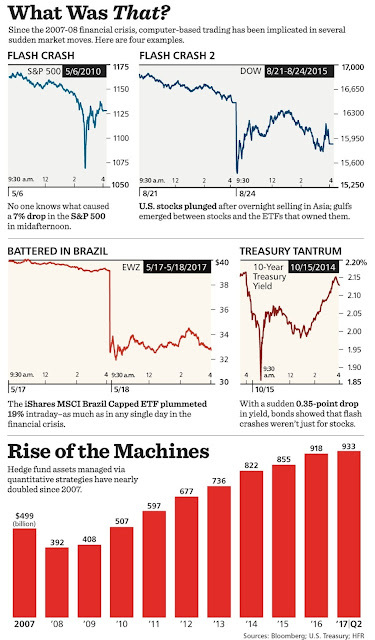 In the rise of computer-driven trading, some hear echoes of the stock market’s 1987 crash. Beware the feedback loop. Quantitative investors understood early on that betting on stocks based on their characteristics—and not the underlying business fundamentals of a particular company—was a good way to outperform the market. So good, in fact, that many fundamental, or “active,” money managers now use quantitative tools to help construct their portfolios and ensure that they don’t place unintended bets. That’s quite a change from the 1980s. If you wanted to place a trade 30 years ago, you picked up the phone and called your broker; your broker called the firm’s trader; the trader would ring up a specialist, the person in charge of running trading in a given stock; and the trade would be executed. The process was slow, cumbersome, and inefficient. As computer technology advanced, machines gradually took most of these steps out of the hands of humans. Today, nearly every trade is handled by an algorithm of some sort; it is placed by a computer and executed by computers interacting with one another. In August 2007, a selloff occurred in quantitative funds that would become known as the “quant quake.” To this day, no one knows what sparked the selling, but once it began, computer models kicked in, causing further selling. Humans added to the mess as risk managers looking at losses dumped shares. Funds specializing in quantitative investment strategies reportedly suffered massive losses: The Renaissance Institutional Equities fund was thought to have lost nearly 9% early in that month, while Goldman Sachs’ Global Alpha suffered a double-digit decline. Follow-through was all the market had in 1987, as selling automatically triggered more selling. To some observers, the risks of a similar scenario are growing. One particular area of concern: volatility-targeting strategies, which try to hold a portfolio’s volatility constant, and risk-parity strategies, which attempt to equalize the risk in a portfolio among bonds, stocks, and other assets—and sometimes use leverage to do it. When volatility is low, these portfolios can hold more-risky assets than when volatility is high. But as soon as volatility rises—and stays high—these types of funds will need to start selling stocks and other assets to keep the risk of their portfolios at the same level. If they sell enough, volatility could spike higher, leading to even more selling. NEW HAVEN – Three cheers for central banks! That may sound strange coming from someone who has long been critical of the world’s monetary authorities. But I applaud the US Federal Reserve’s long-overdue commitment to the normalization of its policy rate and balance sheet. I say the same for the Bank of England, and for the European Central Bank’s grudging nod in the same direction. The risk, however, is that these moves may be too little too late. And what a bet it was. According to the Bank for International Settlements, central banks’ combined asset holdings in the major advanced economies (the US, the eurozone, and Japan) expanded by $8.3 trillion over the past nine years, from $4.6 trillion in 2008 to $12.9 trillion in early 2017. Yet this massive balance-sheet expansion has had little to show for it. Over the same nine-year period, nominal GDP in these economies increased by just $2.1 trillion. That implies a $6.2 trillion injection of excess liquidity – the difference between the growth in central bank assets and nominal GDP – that was not absorbed by the real economy and has, instead been sloshing around in global financial markets, distorting asset prices across the risk spectrum. 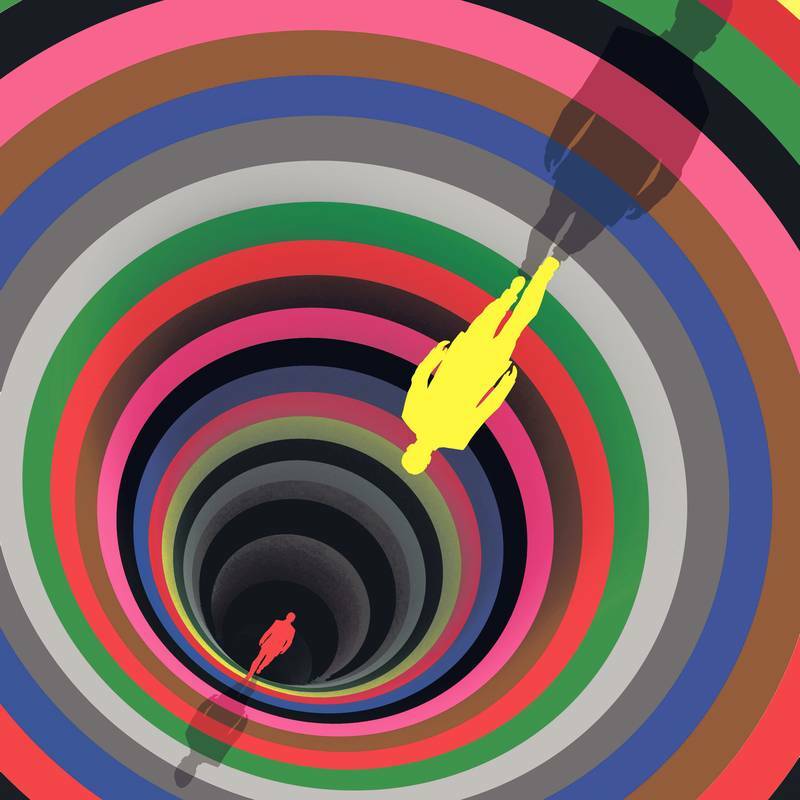 Normalization is all about a long-overdue unwinding of those distortions. Fully ten years after the onset of the Great Financial Crisis, it seems more than appropriate to move the levers of monetary policy off their emergency settings. A world in recovery – no matter how anemic that recovery may be – does not require a crisis-like approach to monetary policy. Inflation fixations are not easy to break. I can personally attest to that. As a staff economist at the Fed in the 1970s, I witnessed first-hand the birth of the Great Inflation – and the role played by inept central banking in creating it. For years, if not decades, after that experience, I was convinced that renewed inflation was just around the corner. This is today’s biggest risk. Normalization should not be viewed as an inflation-dependent operation. Below-target inflation is not an excuse for a long and drawn-out normalization. In order to rebuild the policy arsenal for the inevitable next crisis or recession, a prompt and methodical restoration of monetary policy to pre-crisis settings is far preferable. A failure to do this was, in fact, precisely the problem during the last pre-crisis period, in the early 2000s. The Fed committed the most egregious error of all. In the aftermath of the bursting of the dotcom bubble in early 2000, and with fears of a Japan scenario weighing heavily on the policy debate, it opted for an incremental normalization strategy – raising its policy rate 17 times in small moves of 25 basis points over a 24-month period from mid-2004 to mid-2006. Yet it was precisely during that period when increasingly frothy financial markets were sowing the seeds of the disaster that was shortly to follow. In the current period, the Fed has outlined a strategy that does not achieve balance-sheet normalization until 2022-2023 at the earliest – 2.5-3 times as long as the ill-designed campaign of the mid-2000s. In today’s frothy markets, that’s asking for trouble. In the interest of financial stability, there is a compelling argument for much speedier normalization – completing the task in as little as half the time the Fed is currently suggesting. Independent central banks were not designed to win popularity contests. Paul Volcker knew that when he led the charge against raging inflation in the early 1980s. But the approach taken by his successors, Alan Greenspan and Ben Bernanke, was very different – allowing financial markets and an increasingly asset-dependent economy to take charge of the Fed. For Janet Yellen – or her successor – it will take courage to forge a different path. With more than $6 trillion of excess liquidity still sloshing around in global financial markets, that courage cannot be found soon enough. Germany can’t exist without stable economic partners. Never has it been self-sufficient since it reunified. It must explore alternatives. The most obvious alternative for Germany has always been Russia, either through alliance or conquest. Germany needs Russian raw materials. It also needs the Russian market to be far more robust than it is so that it can buy more German goods. But Russia is incapable of rapid economic development without outside help, and with the collapse of oil prices, it needs rapid development to stabilize its economy. Germany needs Russia’s economy to succeed, and what it has to offer Russia is capital, technology and management. In exchange, Russia can offer raw materials and a workforce. An alignment with Russia could settle Eastern Europe in Germany’s orbit. With the way things are going, and given Germany’s alternatives, the Russian option is expensive but potentially very profitable.